Mass media always tells us what big banks, real estate firms or famous economists think will happen to the housing market, but what do the rest of us think? I picked an article by CBC, (http://www.cbc.ca/news/world/story/2012/09/20/f-rfa-macdonald-housing-prices.html) and reviewed first 141 comments posted. I was curious to see the percentage of people who thought that the real estate market is going to crash in the near future. I organized the comments by the following categories; market will correct, no crash, no side, and irrelevant. “So we have another doom and gloom news paper expert wading into the crap they post. Three years ago these same idiots were predicting that Canada would fall into a deeper recession that the US was in, (and is still in for the most part). The Canadian banks were supposed to collapse two and three years ago. The looney was supposed to be worthless. The housing market was supposed to collapse two and three years ago. Canada's job loss was supposed to be in the double digits two and three years ago. Undecided – This category included people who expressed their uncertainty whether there was something wrong with Canadian real estate or not. The key word here was “if”. Results - The original article contained over 300 comments, and I only examined the first 141. 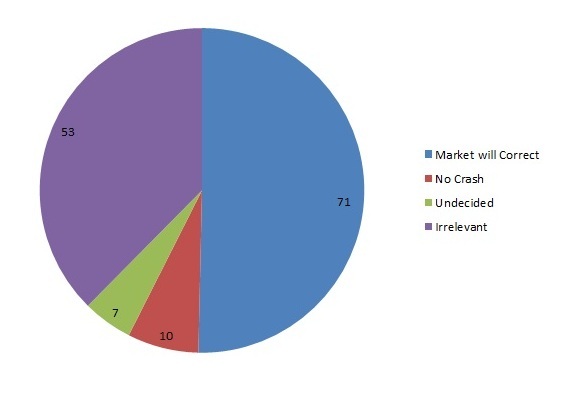 Almost two thirds of the comments were irrelevant, as you can see on the graph below, while just over the half of all comments thought, directly or indirectly, that the market is going to correct in some way or another. While I did not group the individual comments any further, the biggest theme was how overpriced houses and condos are especially in Toronto and Vancouver (surprise, surprise).